Centrum systemiky nabízí unikátní certifikované studium NLP v rámci specializovaných akademií. This course is held in English. NLP Premier Practitioner is designed to develop highly skilled NLP Practitioners by blending New Code and Classic Code NLP. Attend this special course and learn how to use the most powerful tools from NLP to help yourself and others to get more from life. You will get the skills that help you to achieve excellence in your own life and enabling others to absorb those skills for their own use. Moreover you will receive the expertise, confidence and knowledge of practical application to make you a first class NLP Practitioner. 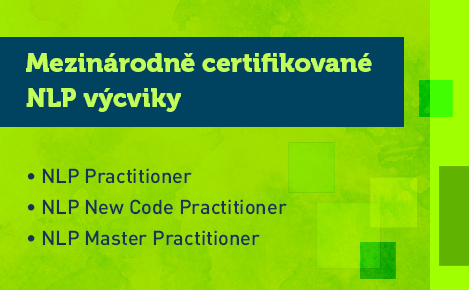 You will have the opportunity to take the first NLP Premier Practitioner course in the Czech Republic. The course integrates these two schools of thoughts: Classic Code NLP and New Code NLP which means that you learn the latest ideas and techniques while understanding the roots of the discipline and remaining faithful to the original ideas of NLP. Successful participants will receive NLP Practitioner and New Code Practitioner certificates signed by NLP and New Code co-creator John Grinder, New Code co-creator Carmen Bostic St. Clair and Master Trainer Michael Carroll. The format of the course is thirteen days that are divided into 5 modules which ensures your new knowledge is compounded by revision of theory and practical exercises. The original works of Dr. John Grinder and his colleague Richard Bandler is known as Classic Code NLP which lays the foundations for the theory and practice of NLP. New Code NLP develops these early ideas and focuses on powerful but easy to apply processes to instigate change work and personal evolution. New Code achieves this at a much more advanced level than Classic Code by aligning ones unconscious mind for choosing which states are appropriate in any given context and ensuring that change be manifested at the level of state/intention, not the level of behavior. Also with NLP training in New Code NLP you will be able to gain access to high performance states which can benefit individuals in all areas of their life. Why attend NLP Premier Practitioner course? The course is beneficial for everybody who are looking to achieve excellence in their chosen field. As an NLP Practitioner you will be able to connect easier with your inner resources and live a life that resonates with your deepest personal values. Representational systems - the structure of information in the human mind; tools for reading non verbal accessing cues, eye patterns etc. New Code games and techniques for deep and lasting change: Alphabet, NASA, Rhytm of Life, Breath of Life, Ball games etc. During the evaluation day participations demonstrate competency with the Classic Code and New Code NLP patterns learned during the course.